Das französische Toyota Land Cruiser Magazine hat in seiner Oktober/November-Ausgabe 2014 einen Überblick über die auf dem Markt verfügbaren Hartschalenzelte veröffentlicht. Neben den beiden großen Playern Autohome® (Maggiolina/Columbus) und James Baroud werden auch die Zelte kleinerer Anbieter gezeigt. Nicht überraschend haben die Dachzelte von James Baroud viele Vorteile gegenüber dem Wettbewerb. Der in französischer Sprache erschienene Testbericht ist auch in einer englischen Übersetzung verfügbar. Das französische Offroad-Magazin 4x4 Mondial hat in der Februar/März-Ausgabe von 2010 einen sehr ausführlichen Vergleichstest der Dachzelte von Maggiolina und James Baroud publiziert. Auch wenn sich der Bericht auf Tests bei Reisen die zwischen 2006 und 2008 durchgeführt wurden bezieht, ist er doch recht aufschlußreich. Bitte beachten Sie, dass einige Bilder und Details nicht mehr den aktuellen Ausführungen entsprechen. Leider haben wir noch keine deutsche Übersetzung des Testberichts, aber zumindest eine in englischer Sprache. When on a raid, the rooftop tent is nice to have, as much for the comfort as for the security. It’s clear that with this type of equipment, the bivouac is installed much quicker, providing more time to rest from a tiring stage. The two world leaders for hard-top roof tents are Maggiolina and James Baroud. These European manufacturers propose excellent models that are a benchmark to date. To help you choose, the day before big departures, we compared the two most emblematic models from each category of each brand- The ‘Extreme’ to the ‘Explorer/Evasion’ for the horizontal opening tents, and the two “wallet” tents, the ‘Columbus’ to the ‘Discovery’. Note the following comparison has been completed during long adventure trips and research undertaken by the Hélios Organisation (332 bivouac nights in total). Indeed, these tests were carried out from June 2006 and July 2008,not only in France and North Africa but also in Spain, Italy and Romania, in summer and winter, sometimes in extreme conditions- in the snow and under heavy rains. In a tent, the condensation is a natural phenomenon caused by the heat and occupant’s breathing. The colder the external temperature, the more condensation there will be inside the tent. Contrary to what some manufacturers and colleagues suggest, it’s not really the presence of a double roof that will impact on condensation. A mono roof tent in Gore-Tex practically does not condensate, even though it doesn’t have a double roof. So why not use that fabric for roof tents? Quite simply, the cost. All mountain or tracking tents are fitted with a double roof, yet depending on the external temperature, by morning they are damp inside. In fact, the components that will really impact on condensation are the material used for the bedroom and the aeration system. Some roof tents with a rigid hull (therefore without a double roof) show less condensation than soft tents with a fitted double roof. For the most part, that comes from the quality and performance of the fabric that is used for rigid hull tents. It also depends on the number and design of aeration openings. Generally, for minimum condensation, it is essential to well regulate the airflow by playing with the openings. A good airflow limits condensation. Saying that, opening the tent will inevitably cause a drop in the temperature inside the tent. In summer or warmer weather that’s not an issue, but it is when camping in winter under hard latitudes. A good compromise is to ventilate the tent as little as possible in order to contain the heat whilst limiting condensation. This is where the material used in the canvas comes into action: it seems that Maggiolina’s Dralon evacuates a little less than James Baroud’ polyester. With temperatures below -14°, in winter, in the Cantal, we did notice that the internal face of Magiollina’s canvas was covered with a thin layer of water. This layer was made up of micro droplets running out on the mattress edges. In the James Baroud, the internal walls were hardly humid and didn’t present any form of droplets. Hard hull roof tents weigh on average slightly over 50kg. Some of them exceed 60kg and, although this doesn’t impact on the vehicle’s driving capacity should still be taken into consideration. To avoid any bad surprises, it is therefore important to plan on solid and well designed roof bars. There are two types of roof bars-those that fit on lateral rails and those that fit on the manufacturer’s anchors. Those anchors are situated on the top of the roof and are designed to receive genuine roof bars. Anchors need products made to measure, fitting specific vehicle models. Concerning installation of roof rails, the choice is wider. Nevertheless avoid Thule roof bars and as a general rule what is sold in large-scale retail stores. Experience has shown that products from large-scale retailers do not resist long under African track conditions. They are perfect to carry a roof box on main roads, but not really suited for the weight of a hard hull tent. Out of this, whether it be from Trekking or Rhinorack (distributed by Warn), you will find excellent, proven products where quality and reliability expectations are always met. Even so, a special mention to the Rhinorack roof bars-they are perhaps more expensive than others but have an irreproachable finish and robustness. Further advice: check regularly the fixing points of the bars, at least those that are in direct contact with the rails. Sometimes, even if the reliability of the bars is not in cause, it appears that the rails are too thin, or not deep enough, as is the case on the Range Rover and the Defender. In this case, the fasteners of the bars can after a while slide on the rail and even come off- this can sometimes create serious damage. In relation to anchor installations, the choice is more limited. Working on the assumption that we can now avoid genuine bars and those sold in large-scale markets, to our knowledge, there is only two brands to consider: Rhinorack and Front Runner. Of note also is that James Baroud provides a 5 year warranty for their tents when installed on Rhinorack bar. Note also that the screws and bolts of the Magiollina don’t fit the Rhinorack bars. Indeed, the screws of the fixing plate are too short for the bars’ sections. In contrast, there is no problem with the Explorer’s screws and bolts, on which the threaded rod are longer and thicker than the Italian equipment. The tested tent is one of the latest models of the famous Maggiolina. It is also the most sold model in France. As is to be expected, the external hull is still on the brand’s standard with a fluid shape, no asperity and an irreproachable white surface. On the lower hull, we find again the traditional plastic chrome beading that, unfortunately, always comes unglued with the same reliability. Two locks in front and another one in the back assure the locking of the 2 hull as well as all other Maggiolina models. So nothing really new, with the exception of the aluminum luggage rack on the upper hull- a handsome little plus which we’ll detail later on. On the finish, we find again indisputably what made Maggiolina’s reputation: the extreme tension in the walls doesn’t leave space for any ungraceful crease and, on the external side, the final return is absolutely irreproachable-it is difficult to find any fault. Inside, the smoothness of the fabric and the general arrangement gives to all a sweet sensation of comfort. The quilted roof shows very good workmanship and the large centered overhead light which outclasses the night-lights of James Baroud’s overhead lights is much appreciated. However be careful: after a heavy rain or in particularly cold conditions, condensation causes some rings on the quilting - it is better to avoid contact with fingers or any objects otherwise it could mark the roof. flap that you slide under the mattress is not totally practical, especially when required to fix the ladder on the edge of the lower hull. The doors are coupled with heavy duty fly screens which can be rolled totally on the top of the roof, avoiding too many unnecessary manipulations when you need to go out in the middle of the night. As with the Columbus, the absence of shelters on top of the doors, and aeration inlets, are noticed. In case of rain, we are condemned to close everything, increasing condensation – red card for the engineering people who should have considered this small detail. The zippers are very easy to use, but the undersized sliders tend to break-this is quite regrettable considering the price of the tent. The canvas side uses a beautiful dark grey Dralon fabric, a change from the traditional blue of the previous Maggiolina model. It is obviously more sober, and when unfolded, the tent is much more integrated to the landscape. This fabric is very soft on the touch and feels pleasant even when wet. It should be noted that even when damp, the fabric doesn’t mark or swell. With respect to the tent’s waterproofness, there was no bad surprise but it’s true that the tent was new. Whilst the Dralon of the Maggiolina cannot be compared with the polyester of the James Baroud, it is waterproof, made of a canvas similar to cotton. Given the amount of water flow that it has to bear, there will automatically come a time when it will lose its waterproofness. The polyester, on the other hand, is totally waterproof from conception. This was noticed when testing the tents in a carwash. Both tents were subjected to a high pressure hose for more than 2 minutes at a distance of less than a meter. Thankfully the mattress of the Maggiolina had been removed because this tent was totally swamped inside. In contrast, the Explorer was totally dry, a sign that the polyester does not let water through. After several month of intensive use, the fabric is free of signs of wear and tear. Marks made from dirt or rubbing are easily wiped off with dishwashing liquid. If the tent is well cared for and stored in good condition, it will keep its new look and feel for a long time. The design of the hull is streamlined, the shape is harmonious with a light bulge on the rear which optimises the storage volume- it’s easy to forget that roof tents can be used as an extra storage box for personal goods. It’s not rare for the upper part of the Maggiolina to lose its shape on the side, in particular when the door’s flaps extend a little bit. This problem can be caused by the thinness of the hull, which is much thinner and less rigid than a James Baroud hull. This also explains the difference in weight of the two tents. The tent is erected using a crank. This crank acts on an articulated chain (similar to a bicycle chain) which as it turns acts on the two callipers located on the rear and the front of the tent. It is these that will be used to fold or unfold the tent. With use, this system didn’t always prove reliable. During our travels, we have met several travelers who had problems with the mechanism of this tent. We were, besides, twice involved in these expensive repairs. Even if those mechanism problems are not common, they do exist. Two suggestions for Maggiolina purchases: carry with you one or two chain links for security, and overall be gentle with the crank when using it. Note that we didn’t have any problem with the tent we tested. We had however been very cautious with the system, as it stuck a little and we found we had to force it. The density of the mattress is totally acceptable. After several uses, the comfort stays the same without any feeling that we touch the hull. However, it is better not to dismount the cover to clean it. It is too tight to put back on and, in our case, we will need to buy another one. The aluminum ladder is very light, without any asperity and thus didn’t hurt our hands. It is indeed a better design than the Columbus Classic but the locking system is not very convenient. The square shape steps are wide enough to be used on bare feet without hurting. This ladder is ended by two flat hooks. If your car has lateral gutters, you will be able to hook it easily; otherwise you will have to install it on the edge of the lower hull which is not very convenient for closing the doors. Some rooftop tents have a fitted place to carry luggage. This option, very useful for long trips, is a nice feature but be careful: this additional hauling has to be used with care… On the manufacturer’s catalogue the luggage rack of the Extreme is seen with a shovel and a spare wheel (rim and tire). Some resellers will tell you that it can support weight from 30kg to 40kg. We would also like to warn those who would like to carry on their tent a spare wheel on African tracks during a long trip. As we noticed several times, they may experience bad surprises: hull tear out, cracks on the roof, tear out of the carrying system. So, this luggage rack can carry light luggage or materials but no more. A spare tire will just fit but certainly not a wheel (rim and tire). Same for the James Baroud luggage rack which the manufacturer advises not to exceed 25kg. So a spare tire will fit without any problem, which is already very good, regarding the space this frees up inside the vehicle. It also avoids buying a spare wheel carrier… which itself costs the price of the tent. Color: white. Weight: 65kg. Warranty: 1 year under certain conditions. In principle, we can only compare what is comparable. It would be great if, opposite the Extreme which is a manual tent (opening with a crank), we could compare a different manual tent. But there it is: James Baroud thinks that manual tents are becoming obsolete. In short, those tents will soon be out of the catalogue. In their place, automatic tents! It’s true that this more advanced system has undeniable advantages: speed of set up and overall reliability. This is why we were required to contrast the Maggiolina Extreme to the Evasion and Explorer which now replace the mechanical models. The Evasion and the Explorer are pretty much the same. The only noticeable difference is that the upper hull of the Explorer is arranged with a luggage rack on the rear. Except for this detail, the tents are the same. Both of them feature automatic horizontal opening, the only ones of this type on the market. As we have tested the latest Evasion model, we will talk about this one. The inside volume is quite similar to the Maggiolina Airlander or Safari in medium version. No calliper at the head and at the feet, however we find a reinforced and articulated calliper at every corner of the tent: this reduces slightly the surface of the bedding, but is so insignificant that we hardly notice it. Though we don’t have the same height over the head as the Discovery (150cm against 95cm for the Evasion or the Explorer), we really appreciate the sensation of space and comfort that only comes with horizontal opening tents. This feeling of space takes another dimension with access to a rear door. Indeed, if we open the three doors in the morning, and especially if we have time for a sleep in, we really have the feeling of space we won’t find in other tents of that type. There is nothing to find fault with regarding the finishing. Everything has been considered to obtain a classy finish. Dispensing with the old quilted padding of previous centuries, James Baroud has used, over the last 4 years, a new padding similar to the one in the car. This change from the traditional ‘stagecoach’ padding is pleasing to the eye! Like the Maggiolina, the Evasion has an internal light. But here again, we play with modernity: breaking from the traditional lights found just about everywhere, the Evasion version is a torch with LED, extremely powerful and totally mobile. Beyond the fact that we can trail round everywhere in the tent (we can even clip it to a belt), the torch dispenses a nice light with an intensity that largely supersedes all that we could test at this time. Noticed is a clever system of rubber bands that allows the canvas to stay inside when closing the tent. Faithful to his principles, the manufacturer has not forgotten the (removable) lateral pockets, to store small objects. Those pockets are made from netting material the same as used for mosquito nets, quite useful to locate what has been stored at a glance. As with the Maggiolina, we find at the front and the back of the room aeration windows lined with an extremely strong mosquito net. A storage net finishes the inside fit-out – A little plus missing from the Italian tent. The canvas part of the tent uses a fabric which is thick but also soft, polyester (250gr), in a nice dark grey color. This material is treated against UV, non perishable, does not wear over time, even when used intensively. It repelsthe sun’s rays and is extremely resistant to tear. The tension of the canvas is very good despite the rubber band that surrounds the tent and gives a gathered aspect. This rubber band facilitates the closing of the tent without the need for inside tension rubbers. After several months of intensive use, the canvas does not show any sign of wear and tear. In addition, the texture of the fabric and its satin-like aspect seems to repel unwanted dirt marks. In contrast to the Italian tents, the canvas’s part extends from the hull which gives a warranty of waterproofness against infiltrations - the tent is totally waterproof. Indeed, this would cause problems regarding condensation if they weren’t all modular openings, in front, rear and on the sides (three doors and two rigid aeration inlets). Thanks to those last ones, the airflow is well managed. Note that those aeration inlets are surmounted by a rigid triangular cap. This feature, exclusive to James Baroud, allows for keeping the inlets opened even when raining heavily. The most outstanding innovation in the tent apart from the rubber band and the automatic set-up is especially its VMC (controlled mechanical ventilation). As in a house, the Evasion has a controlled mechanical ventilation. This clever system is made with a solar battery which runs a propeller used to extract hot air coming from the occupants of the tent. On its own, the system is very simple but it had to be thought of to install it on a tent! 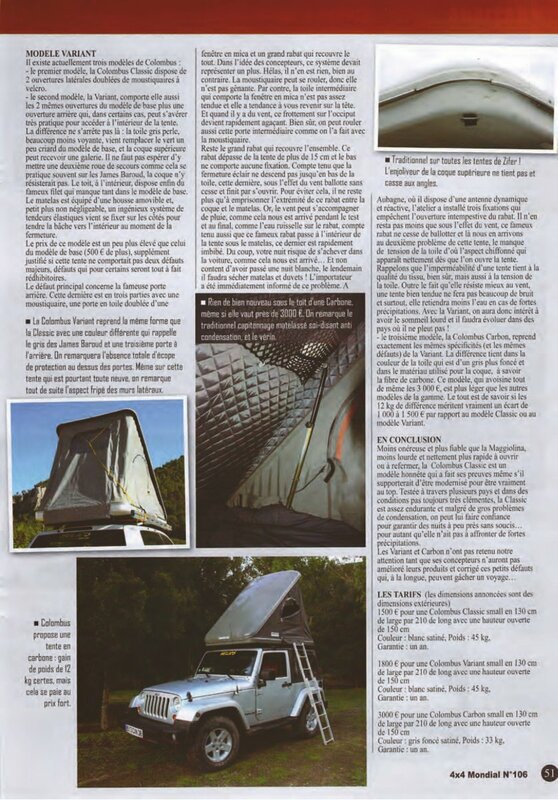 When this tent was tested last winter in the Cantal, at the same time as the two other Maggiolina and a Discovery, it was the one that condensated the least, whilst keeping an interior temperature higher than the other ones (4°C). On that subject, note that it is possible to install on the tent a cap for the winter (221€) which keeps the temperature a few degrees higher. A little plus that you will certainly appreciate if you have to camp in extreme conditions. Returning to the openings, every door is lined with mosquito netting reinforced and ended with a Velcro band which gives a good hold even without closing the zippers. Contrary to the Maggiolina’s doors, here the openings are correctly sized; they come to just cover the edge of the lower hull, thus there is no risk of blockage or trouble closing as is the case with the Italian tent. In addition, the modular lateral door openings allow the occupants to leave the upper part open for a better airflow. The design of the hull is not as sharp as the Maggiolian but the shape is just as harmonious, with a small fin which gives a particular style and with tail-lights which gives a more aggressive look. Other particulars: lateral air inlets allow a good airflow when the tent is closed, avoiding any risk of moisture when the tent is folded down when not totally dry. Also of note is the double locking with secure latches, in front and on the sides of the hull. This smooth running system avoids any untimely opening. Here again, we appreciate this little detail that shows that the designers of the tent are also users. Reduced to its simplest terms! In fact, it is a cavity at the rear of the upper hull. 6 anchor points are available for the attachment of a soft luggage case (an option) or a spare tire. The lot is totally reliable as long as we don’t overweigh the load. We did travel more than 62 000km, In France and overseas (8 000km on African tracks) and we didn’t have any trouble with this luggage rack on which we did put permanently a spare tire (without rim). Like the other automatic tents of the brand, the Evasion and the Explorer do not show any dysfunctions while setting up, whether with the opening or with the closing. The opening of the tent is automatically done thanks to four tough struts that the designers even thought to cover with fabric. Those struts are assisted with aluminum calipers which make the whole more rigid and allow the tent to accept without flinching very hard lateral wind. Here again, we can recognize the adventurer touch! The closure is done without strain starting with the front and finishing with the rear. Once we have the trick in hand, the tent can be folded down by only one person in less than a minute. It unfolds without strain, its steps have a comfortable flat section and, security wise, the upper extremity ends with two hooks which can be fixed in the sockets made for this usage on the sides of the lower hull, at the level of the two doors. The ladder is delivered originally in a polyester cover so it won’t dirty the inside of the tent and won’t damage the roof padding. Always the concern of details. Not being too hard, the density of the new mattresses shows an excellent compromise between comfort and absorption. The cover is really removable, contrary to the Maggiolina’s mattress which once washed, can’t be reinstalled. Color : white or grey or black Weight: 69kg. Warranty: 5 years without any restrictions. Less known than the Maggiolina, the Columbus appeared on the market just over 8 years ago. Manufactured by the Italian Zifer, from the Autohome group, it is distributed in France by Narbonne Accessories. When closed, it looks pretty much like a Maggiolina. But the difference immediately appears when erected: using the “wallet” system, the Columbus opens like an oyster, creating very nice internal space. This tent is available in three sizes (Small for 1 to 2 persons, Medium for 3 persons, and Large for 4 to 5 persons) and three models: Classic, Variant, and Carbon. There is nothing much to say regarding the finish: the whole is fine, no more, and there is not much innovation from the models launched 8 years ago. Inside, the quilted padding of the ceiling has a good look, but we regret the lack of storage netting of the Classic for storing clothing or other personals effects. The two lateral doors are very convenient with their large openings and the double cursor zipping that allows partial opening of the door on the upper side, giving some privacy and allowing better airflow to regulate condensation – as long as it doesn’t rain, of course. Knowing that the doors do not have any protecting awning – a sort of cap on top of the air inlets or doors – in case of rain or snow, we are required to totally close the doors to stay dry inside. Consequently, the possibility airflowis suppressed, resulting in a strong condensation. The doors are lined with a mosquito net that can be fixed or removed quickly, thanks to a clever velcro system. There is no overhead light in the tent but there are two lateral pouches that can accept small objects. The canvas part of the tent is made from a fabric that is similar to the Dralon of the Maggiolina. Called Airtex, this fabric is moisture free, totally isolated and designed to resist tear. However, during our travels, we have observed more than one Columbus tent with fine tears at the back caused by the rubbing of the hull on the canvas. Another thing regarding the space in this tent: the lack of tension in the canvas observed in some models slackens the walls, allowing the rain to hang on. On this point, regarding waterproofness, the Columbus shows an unacceptable deficiency. In the event of heavy rain, the water flows on the walls and soaks through at the lower junction of the hull. It does not soak on the top, but over time, the mattress is soaked and can rapidly become a sponge full of water. This problem has been encountered with three of the Columbus tents and the users finished their night inside the car. The design of the tent is as well shaped as the Maggiolina. The shape is harmonious with a small swelling at the rear that allows a better volume of storage. The upper hull is finished with a beading that goes all around the tent. This beading tends to come off, and when driving in the forest it clings on branches and breaks. Note that this beading has a partial role in waterproofness or airtightness when driving. At high speed, on highways for instance, if this beading is missing, the upper hull might swell and distort, and the canvas may extend out of the hull. If this occurs, the only thing to do is to exit the highway as soon as possible and put back the overflowed fabric. Another solution to prevent this recurring problem: install some hooks on the sides and tie straps that will maintain the upper hull. An ungainly fix, inappropriate given the price of the tent. This fault has been reported to the manufacturer but never corrected. ladder! Thanks to the two struts, the opening of the tent is automatic and instant, without cranking, without mechanism and without forcing. A record to beat. Regarding the ladder, the manufacturer should seriously review its model. Not only inconvenient to unfold and install, the ladder of the Columbus Classic is uncomfortable, with steps that are too small and hurt the feet if you are without shoes. And we won’t mention the squashed fingers when we fold the ladder! At the end, a majority of the users replaced the ladder with another more serious model. By the way, the folding ladder sold by Narbonne Accesoires (115€) is much more convenient than the original ones. In older models, the high density of the foam was average (especially if we are not a light weight). The manufacturer has responded and now we have good bedding that no longer requires an additional gym mattress as was the case with previous models. The first model, the Classic, has 2 lateral openings lined with Velcro mosquito nets. The second model, the Variant, comes with the same 2 openings plus a rear opening that, in some cases, can be very convenient to access the inside of the tent. This is not the only difference: the less garish pearl grey canvas replacesthe loud green of the first model. The upper hull can accept a roof rack. Don’t expect to put on a spare wheel as is often done on the James Baroud, as the hull would not cope. The inside ceiling at least has a storage net that was missing in the first models. The mattress is fitted with a removable cover, and another small non negligible detail, a clever system of stretchers fixed on the sides that stretch the inside when stowing the tent. The price of that model is a little bit more expensive than the first model (500€ more), which would be justified if the tent didn’t havetwo major faults - faults that are damning for some. The principal fault affects the rear door. This is in three parts: a mosquito net, a door lined with a window made from mica, and a large flap that covers the lot. In the designer’s mind, this system should be a plus. Unfortunately it isn’t. The mosquito net can be rolled, so it is not annoying. However, the intermediate canvas that has the window is not stretched enough and tends to come back on your head. When the wind is blowing, this rubbing on your head very quickly becomes annoying. Of course, we can also roll up this intermediate door as with the mosquito net. Now the large flap that covers the lot: this flap extends from the tent by more than 15 cm, and the bottom does not have any fixing point. As the zipper does not come as far as the bottom of the canvas, under wind pressure, the flap tosses nonstop and finally the zipper opens. To avoid this, we have to squeeze the flap in between the hull and the mattress. Yet, when rain comes as well as wind, as happened to us during the tests, in the end, with water flowing on the flap, and flap squeezed in between the hull and the mattress, the mattress was rapidly soaked. The night might end inside the vehicle… and not happy to have a sleepless night, the next day we’ll have to dry the mattress and the sleeping bags! The importer has been immediately informed of thisproblem. In Aubagne, where they have a dynamic and reactive branch, the workshop has installed three fixing points that avoid unwanted openings of the flap. Nevertheless, with the wind, this flap constantly tosses, and so we come to the second problem of that tent, which is the lack of tension in the canvas, giving a creased aspect when the tent is opened. Remember that waterproofness comes from the quality of the fabric but also from the tension of the canvas. Beyond the point that it has a better resistance to the wind, a firm tent will not make much noise and mostly, it will not retain water in case of heavy rain. With the Variant, we will need a heavy sleep and use it in country where it does not rain! used for the hull, in this case carbon fiber. This model is close to € 3 000, and is lighter than the other models. Overall, the main point is to determine if the 12 kg difference is really worth the 1000 to 1 500 € price difference between the Classic model and the Variant model. Less expensive and more reliable than the Maggiolina, lighter and much quicker to set-up or stow, the Classic Columbus is an honest model that proves itself even if it could use some modernisation to be really at the top. Tested in various countries and in conditions that are not always the best, the Classic is tough enough and in spite of condensation problems, we can rely on it to guarantee nights without too much worry… So long as we would not have to bear with heavy rain. Variant and Carbon models do not warrant attention as long as the designers won’t improve their products and correct those little faults that can ruin a journey. Columbus Classic small in 130cm wide by 210 long and an height of 150 cm opened. At first, the Discovery looks like the other tents of the brand but when erected we notice the difference in design straight away. Like the Columbus, the Discovery model has a “wallet” opening thanks to its heavy duty articulated struts- . So here again, there is no strain, no mechanism and no risk of breaks. With its 150 cm external height, the Discovery provides excellent internal space that should charm even the tallest. On the finish side, it’s a satisfactory result. Whether from the inside or the outside, we did notice a lot of little details and innovations: regarding the ceiling, James Baroud finally disposed of the traditional quilted padding and has replaced it with a more classy padding which can be fully compared to a vehicle roof padding. There is no overhead light in the tent. Instead, we find a small portable LED torch. This one is fixed on the ceiling by a Velcro system. It’s removable and we can use it like any portable lamp. Its intensity and its durability are phenomenal! We will also note a clever system of rubber bands which allow for better folding of the canvas in the inside when stowing the tent. Faithfull to his customary design, the manufacturer didn’t forget lateral pouches to store small objects. In contrast to the Columbus, the canvas overlaps the hull, guaranteeing an unequaled waterproofness. We suffered several storms and even a snow storm. In spite of the violence of the wind and heavy rain, we were never wet. In less hard conditions, in plain and under less heavy rain, the Columbus was flooded. Since 2007, the Discovery has been fitted with 3 doors lined with reinforced mosquito nets. Two of its doors are fitted with modular openings allowing opening of either the upper part or the whole door for optimizing airflow and limiting condensation. Those doors are surmounted with a protective awning which allows for keeping a nice opening even under a heavy rain. Like the Columbus Variant and Carbon, the Discovery is fitted with a large back door. But the comparison ends there: this time the flap is perfectly tight and the mosquito net does not rub your face during the night. No flapping and no noise with this door even in strong wind (note that the primary flap is fitted with an air inlet, a deadly miss in the Columbus). The canvas part of the tent uses a fabric which is thick but also soft, polyester (250gr) in a nice slightly dark grey colour. This material is treated against UV, is non perishable, and does not wear over time, even when used intensively. It repels the sun’s rays and is extremely resistant to tear. The tension of the canvas is perfect and as we can see in the pictures, we cannot see on the Discovery any of the Columbus’ flabby and ungracious folds. After several months of intensive use and friction, the canvas does not show any signs of wear and tear. Indeed, the texture of the fabric and its satin-like aspect seems to keep those undesirable stains that usually decorate the Columbus canvas away. The design of the hull is a little bit less aerodynamic than the Columbus but the shape is as harmonious, with a small rear fin that gives a certain style and tail-lights that add a more “aggressive” touch. We note the double locking with secured catches on the sides of the hull. This well run system safeguards the travelers from an unwanted opening. Here again, we appreciate a little detail that proves the designers of this tent are also users. Like the Columbus, the Discovery does not display any issues when setting up, either during the set up or stowing process. The tent is automatically erected with two strong struts which the designers thought to cover with a thick fabric-like neoprene. The struts are assisted by an aluminum caliper that gives more rigidity to the whole and allows the tent to undergo strong lateral winds easily. Once again, we recognize the touch of the adventurer! The stowing needs more strength than the Columbus but the process can be done alone as long as we apply the trick of using the lateral catches as advised. It unfolds without strain, its steps have a comfortable flat section and, security wise, the upper extremity ends with two hooks that can be fixed in the sockets made for this use on the sides of the lower hull at the door level. Not too hard, the density of the mattresses represents an excellent compromise between comfort and absorption- no need to add an additional mattress. Be it its conception, its innovations, its high level of finish or the quality of the materials used, this tent is a beautiful achievement with a promising future. Well adapted to any conditions, even extremes; it will never disappoint the most demanding adventurers. The Maggiolina arrived on the market well before the first James Baroud tent, as did the Columbus which appeared 5 years before the Discovery. So we can tell that Zifer was the frontrunner on that score. Having said that, the Columbus looks very like the Bivouac Tent from Trekking that was marketed 10 years before. However, the objective is not to know who copied who. The objective today is to define what is the best product and who is the more dynamic manufacturer. As far as we know, when we closely follow the evolution of the roof top tents over the last 10 years, we have to admit that the Italian Zifer has rested on his laurels little bit, while his direct competitor, the French-Portuguese James Baroud, never stopped innovating. In fact if we have a close look, the Maggiolina did not really move on since the first models. On some models, whilst the color changed, the cranking set-up remained, with its quality and especially its faults; the openings are still not fitted with protective awnings, and we still find those too-long flaps. Add to this a ceiling that has not evolved from the stagecoach, the lack of a storage net, the finish beading that always falls off and the zippers that break… quite a lot of small details that could be corrected with time. Same report for the Columbus which, since its first launch, has not had major changes. Contrasted with this conservatism, we have two tents, the Explorer/Evasion and the Discovery, that since the first models, have found a lot of improvements to reach, in few years, a level of quality that makes them usable in extreme conditions. And all that, at the same price as the Italians.